Concrete Floor Stain - Staining Concrete - How To Stain Concrete Floors. Applying concrete floor stain to your plain gray concrete floor can transform it into a beautiful work of art. Staining the concrete can add rich vibrant colors or more earth toned colors depending on which kind of stain you choose. Designers and homeowners are attracted to concrete stain because of the unique results that can be achieved combining colors and application techniques. Acid stain works by penetrating the concrete surface and reacting chemically with the concrete. This makes it a permanent part of the concrete. The stain does not wear off the surface like a concrete sealer or a concrete paint does, eventually. 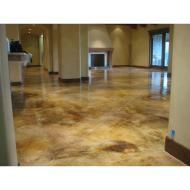 All concrete floors accept stains differently. This creates natural color variations that are unique to each floor. Most acid stains mimic earth tones like tan, brown, terra cotta, blues, and green. They are also translucent, meaning the condition of the concrete they are applied to has to be taken into consideration before staining. Concrete dye is another way of staining concrete. These are water and solvent based stains that offer much more vibrant colors like yellow, purple and red. Dyes penetrate the concrete surface and usually dry very fast. Clean up is much easier with dyes compared to acid stains allowing for the job to be completed much faster. How to stain concrete floors step by step? 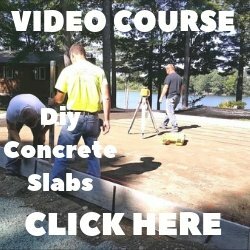 How to stain concrete the surface preparation? What kind of different colors are there? Do I have to apply a concrete sealer over the stain? Is a stained concrete floor easy to maintain? 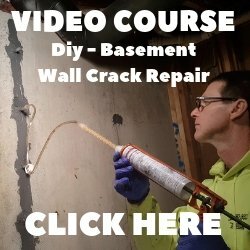 Click on Concrete Stain Tips and Techniques to find the answers to your questions. Once you learn about all the benefits a concrete floor stain will add to your concrete floor, I think you'll be happy you chose to stain the concrete instead of covering it up with some other type of flooring material. A how to guide for PAINTING A CONCRETE FLOOR. What do I need to know about PAINTING CONCRETE FLOORS?